If youve ever tried to grow a lush, productive vegetable or flower garden in your yardwhich you hoped would be the envy of your neighborsonly to have pale, lifeless plants emerge from the earth and struggle to hang on, then you may need to practice composting. To add compost to your dirt is simply feeding the earth. Although there is currently a composting revolution in the USA and other parts of the world, it is not a new idea. Before population growth began to claim miles and miles of forest land, there was fertile soil to be found because of compostingleaves had piled up on forest floors and decayed. The rotting leaves were returned to the soil, where they fed the soil with their nutrients. Nomadic travelers dumped their food wastes in piles near their camps, and these wastes rotted and also fed the soil. So, simply said, compost is the breakdown of plant materials and other once-living materials which can feed and make our dirt a dark, enriched, crumbly soil that is easy to work with and excellent for growing well-nourished plants. Composting is valuable, not only to your yard but to the environment as well, as widespread composting can drastically reduce the volume of waste now being sent to overflowing landfills. So the benefits of composting are two-fold: you will contribute to the composting revolution by composting your own yard and kitchen wastes at home, and at the same time, you can utilize this black gold on the plants in your yard. Learning to compost is easy. Following are some guidelines to help you get started. Compost Bins or Piles - Depending upon how much compost you will make (which is limited to the amount of composting materials you have available, such as leaves, plant parts from your garden, food scraps, etc. ), you can have two or more compost bins. You can even start with one, but two works better because the ingredients (stuff) you put in firston the bottom of the pilewill decompose first. So, to get to the finished compost on the bottom, youll need to remove the partially decomposed materials on the top. Simply transfer those partially decomposed materials to the second bin, where they will continue to rot. Add more raw material on top of them, and they will then be the next in line for black gold to go in your garden. - Turning the pile in this manner will aerate the pile and help to quicken the composting of the materials. Adding earthworms to the pile will also aid in the aeration and decomposing process. (Ask your garden center expert for sources, or try entering garden worms in an online search engine.) - Do-it-yourself bins may be constructed of various materials, including two-by-fours (untreated), concrete blocks, recycled wooden pallets, and heavy-duty wire. Ready-made compost bins, made of recycled plastic can be purchased at many garden centers. Also available for purchase are the more expensive drum-tumbler systems. - Go binless by simply building a compost pile in a convenient spot on the ground; it may take the compost longer to ripen, but it will work as long as you keep it moist and aerate it by turning it occasionally. 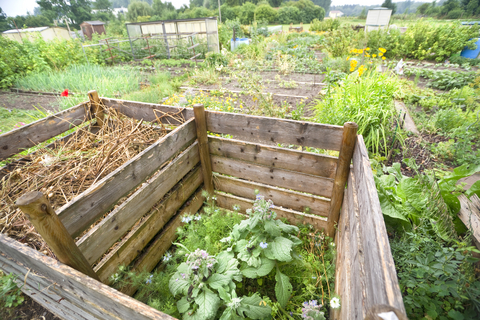 Caring for your Compost Pile A compost pile is a living thing; it needs air, water and food. 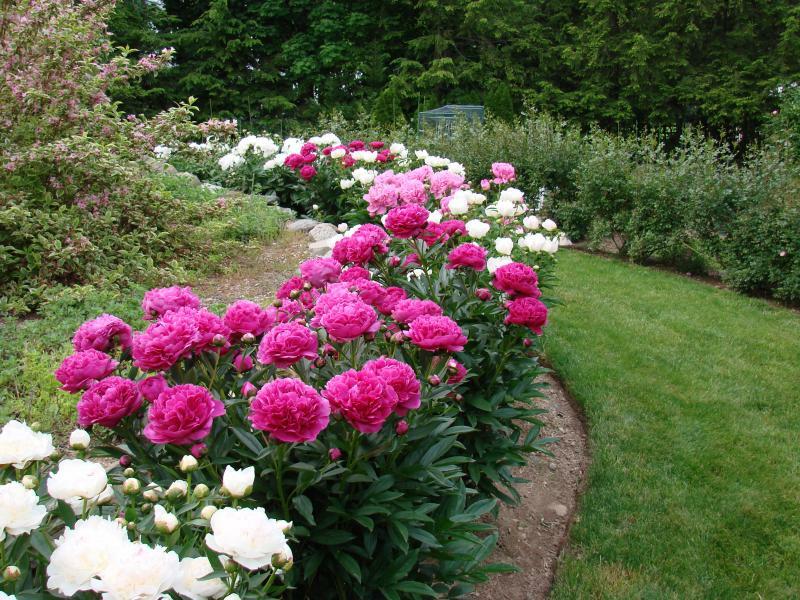 Provide those needs and youll be rewarded with rich compost to spread throughout your garden. - Air: The microbes in the compost pile are aerobicthey must have air to do their job, or non-air needinganaerobicmicrobes will take over the pile. And if they do, the result will be a slow rotting, stinking mess! So, make sure you cause plenty of air passageways by adding ingredients that dont mat down, such as straw, in amongst the matting grass clippings. Also, make it a habit to routinely fluff-up the pile with a garden fork or spade. - Water: Not enough moisture or too much water is not good for your compost pile. Ingredients in the ideal compost pile should remain about as moist as a wrung-out spongethat is, a thin film of water should coat all ingredients in the pile. If your pile gets too dry, the good microbes slow down. If your pile gets too wet, the ingredients become water-logged and mat down, pushing air from the pile, and the bad microbes will begin to take over. So, moisten dry ingredients as you add them to the pile. Grass clippings and kitchen fruit and vegetable wastes usually have enough moisture in them when you add them to the pile. In rainy season, you can cover your pile with a tarp, as needed. In a dry season, water your pile as necessary to maintain proper moisture. - Food: Feed your compost pile with browns and greens. Browns are dry materials: pine straw, wheat straw, corn stalks, autumn leaves, and wood chips or sawdust (not treated). Greens are fresh plant materials from the garden, grass clippings, green leaves, fruit and vegetable scraps from the kitchen, and even coffee grounds and tea leaves. Since browns are dry and greens are moist, a good mix of the two will help to keep the pile moist and aerated. There must be a mix of the two because the greens contain more nitrogen, which is needed as a protein source for the billions of microbes in the pile. Do Not Feed Bad Things to your Compost Pile The following items may be toxic, contaminated with plant or human diseases or could result in weed problems. Do not add them to your compost pile. -Pet wastes - Human wastes - Most weeds, unless they are completely dried out (brittle) so that their seeds are killed. - Meat, bones and any fatty food wastes. They could attract rats or other animals. They will also slow down the composting process. - Diseased plants. - Chemically-treated wood chips or sawdust. Uses for your Compost Most experienced gardeners know the smell of good soil. Thats what finished compost smells likesweet and earthy. Its dark and crumbly. It may still have bits of hard-to-decompose materials visible, such as straw, but you can use it at that point. 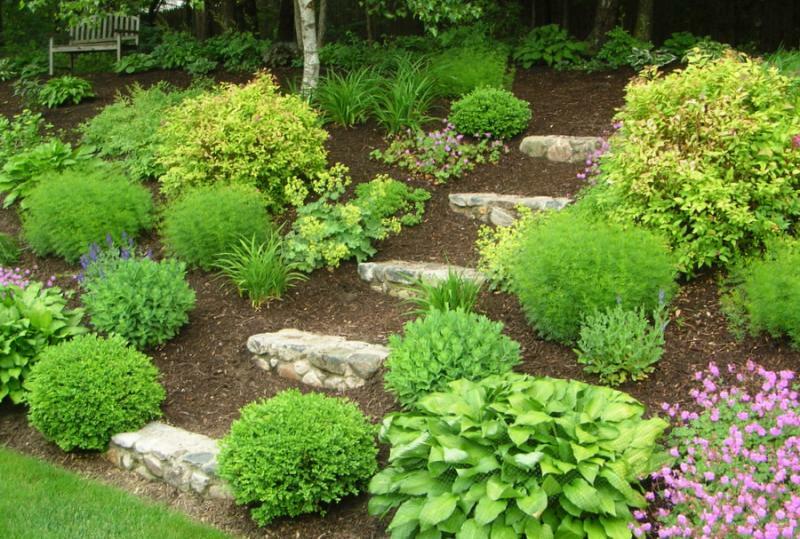 Following are some ideas for its use to enhance your yard. - Soil Amendment: Turn compost into your soil in spring as soon as the ground can be worked. If you live in a warmer climate and garden during the fall and early winter, dig in a little more compost when changing out your beds for the season. You can also top dress the soil during the growing season. 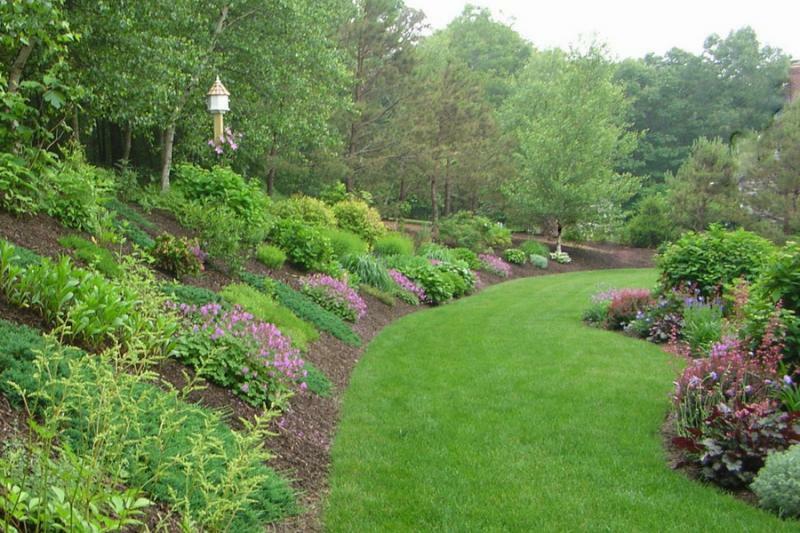 - Soil Improvement: Compost benefits the soil in several ways that synthetic fertilizer cannot. It adds organic matter, which improves the way water flows through the soil, and thereby creates a habitat for the good microbes. The microbes extract nutrients from the minerals in the soil and pass these nutrients on to the plants. - Compost Tea: Combine equal parts of finished compost with water, let it sit for a day or two, then add it to ailing plants, seedlings or transplants for a quick dose of medicine. - Compost Mulch: When you mulch your established plants with compost, it not only protects the soil from erosion and from the drying effects of the wind and sun, it adds immediate nutrients to the soil. Although good for coverage of the soil, pine bark and straw are very slow (many months) to break down and provide additional nutrients to the soil. Remember, a successful garden depends upon the earth itself. Soil needs to be loose so that it can breathe and water can flow through it. Keep your share of the earth healthy with compost; its organic matter that feeds the soil and creates air spaces.